You must be a member of the San José Outdoor and Water Sports Group to attend this activity. Would you like to join this group? Exciting descent down 4 waterfalls in Turrialba. 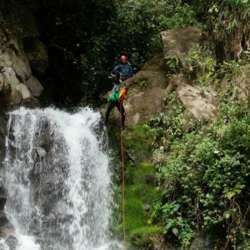 We will be repelling down 4 waterfalls, between 4 meters and 15 meters in height. The pools at the bottom of the waterfall are not deep. The third and fourth ones have warm water from the nearby volcano! Afterward changing clothes, we will be having lunch, which is included, at typical Costa Rican restaurant. When we arrive at Protected content we will have a 30min drive to the finca. Then a 30min hike to the first waterfall. There we will get geared up for our descent into the beauty that CR has to offer. We should be back at Protected content by 2pm.